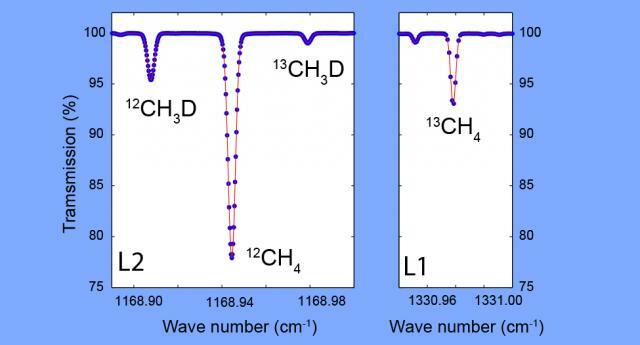 In Analytical Chemistry, researchers report a new way of unlocking molecular information by measuring the abundance of the doubly substituted isotopologue of methane, 13CH3D. Methane is not only an important energy resource and a major component of biogeochemical cycles, but also is a significant and long-lived greenhouse gas. The majority of methane on Earth is of biogenic origin (from both microbial methanogenesis and thermogenic gas production, the latter by thermal cracking of higher molecular weight hydrocarbons). Abiogenic methane sources, from water rock reactions or magmatic sources, may also contribute to methane budgets in specific geologic settings. Bulk carbon and hydrogen isotope abundance can provide important constraints about sources of methane, but interpretations based on these two parameters alone can often be inconclusive due to overlap in source signature, mixing of multiple sources, and changes in isotopic signatures due to secondary processes such as oxidation. Lead author Shuhei Ono and his colleagues at MIT, in close collaboration with scientists at the University of Toronto and Aerodyne Research Inc., now report in Analytical Chemistry a new way of unlocking molecular information by measuring the abundance of the doubly substituted isotopologue of methane, 13CH3D . Doubly substituted or “clumped” isotopologues are rare subsets of a population of a given compound, such as CH4, that contain both a heavy carbon isotope (13C) and a heavy hydrogen (2H, or D). Formation of such doubly substituted (clumped) isotopologues is favored at lower temperatures, and theoretical calculations predict a correlation of decreasing frequency of the doubly substituted molecules as formation temperatures increase. Although techniques for exploring this phenomenon have been extensively developed for CO2 for paleoclimate research, they are only beginning to be explored for the basis of a novel geothermometer based on CH4. The clumped isotope effect is very subtle, about 0.6 % at most, such that a highly accurate and precise technique is required for practical application. The MIT method takes advantage of novel tunable infrared laser direct absorption spectroscopy (TILDAS) technology, similar to instruments currently deployed on Mars as part of NASA’s Curiosity Rover mission. The TILDAS instrument is capable of measuring 13CH3D abundance at parts per billion levels. Such a high precision TILDAS instrument will open up a new frontier in isotope methane fingerprinting by providing researchers in the deep carbon science community with a new system that, due to relatively low cost, can be broadly disseminated to the research community for distinguishing geological and biological sources of methane in the atmosphere, hydrosphere, and lithosphere. This research was supported by the Deep Carbon Observatory, the US National Science Foundation, and the Natural Sciences and Engineering Research Council of Canada.